While Georgia has some up and coming cities like Savannah and Atlanta, there are plenty of back woods areas that makes going off-road easy. The old fashioned hospitality, great food, and welcoming locals seem to beckon to those who are looking for adventure in this Southern state. Whether using a four wheeler or a jeep makes no difference, there is plenty of rich soil that makes mud running an adventure. 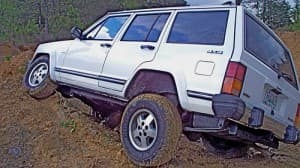 Here are some location on where to four wheel in Georgia? Back in the off road areas, there are some of the most breathtaking sights around. Georgia has a rich colored soil that is a reddish-orange and plenty of waterfalls, lakes, rivers and the most important, woods. Finding a great spot to go off-roads in Georgia may be hard, simply because there are so many to choose from. One of the easiest areas to find great trails is around the Northern part of the state. Gilmer County Georgia 4×4 Trails offer a moderate course that is suitable for all types of vehicles. Located in Amicalola Falls, GA these 5 miles courses are sure to please. It is easily accessible, as it is situated in the Chattahoochee National Forest and near the Dawson Falls area. There off road trails provide great scenic views, as there are many cascading waterfalls close by. Take a lunch and have a picnic by the falls. There is much to see and do in this area. While up in the Northern part of the state, be sure to head east and check out The Beasley Knob ORV Trail. This center has 10.8 miles of rugged terrain. In Union County, the 8 interconnecting trails prove to be a challenge for those who want a real thrill ride. The trails are all considered to be complex, so this is not for the novice. There are some developed trails and some that are not. They only allow riding on trails that are fully developed at this time. The trails are located in the some of the most rural areas in the state. With a population of over 600 people, Blairsville is just about as back woods as it gets. The Davenport Trail offers some great riding in the Nottely Lake area this part of Georgia. Davenport has some moderate to steep grades and the views of the lake are spectacular. There are five miles of trails and the novice can find some good riding here, as well as the expert. With loops and plenty of mountains riding, motorcycles are also allowed here. In Georgia there are many trails. Most of them tend to be toward the Northern, unpopulated part of the state. However, there is adventures to behold in all parts of this Southern charmer.